We provide a rock-solid bridge between the old economy and the crypto world: We seamlessly send AML-ed Fiat on and off the chain. element36 is a solution to the most pressing shortcomings of blockchain, when it comes to using the technology in existing businesses. // Volatility of Cryptocurrencies: We're putting state-run currencies like the Euro, Pound or Swiss Frank on the blockchain. // Legal ruling: We provide legal security for those who want to work with state currencies on the blockchain through smart contracts. // Usability: With our automated bank interface, anyone can with a bank account may interact with a blockchain solution - legally. Regulated by Swiss Financial Authorities. 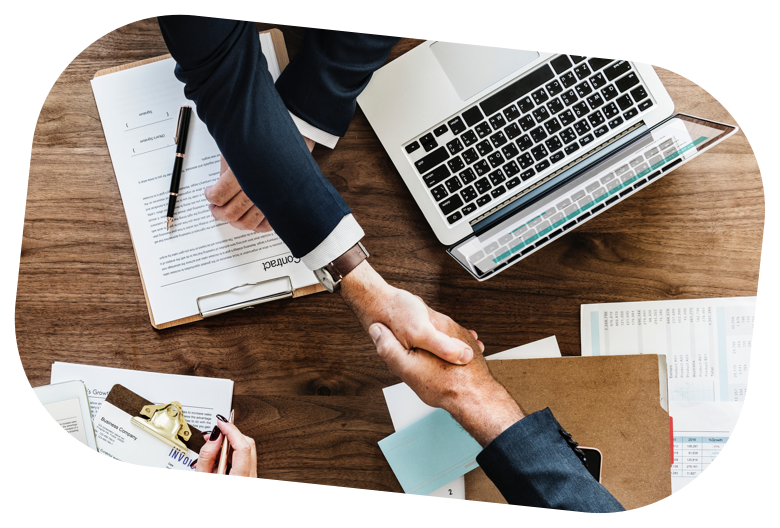 Your funds are held by a bank and are not used for other purposes - and we work within the heavily regulated Swiss financial ecosystem which follows only highest international standards. Legally your funds are managed within a regulatory sandbox. We are currently not actively supervised. Businesses involving third parties get complex soon and are mostly driven by paper or email. We put your contracts on the blockchain, including the “flow of money”. Thus you can automate processes, which involve escrow services. Cases like buying real estate, milestone payments or complex international trade finance can be built on top of element36. Once you have climbed our AML wall, you can move capital freely within the network: You are able to exchange funds and participate in Smart Contracts. Within our network, we are able to reuse identities and provide our customers a kickback, if an identity is reused which you have onboarded. It also makes the transaction-life much easier for participants, who are based in countries with a less trusted banking system. Fiat currency pegged 1:1 on a Swiss bank account. Market cap of crypto-fiat will always be same as balance of the bank account. Holding tokens of element36 means you have successfully identified yourself and are entitled for doing investments. 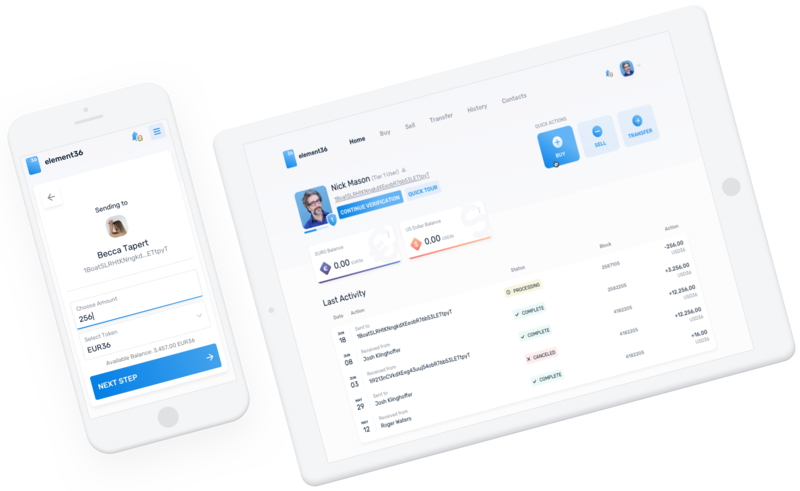 Any smart contract using our token will get the checked ID of the investor. Made to be used in Smart Contracts. It means that you can not only use stable Fiat in your Smart Contracts but also accept or trigger wire transfers from and to banks. We are offering Euro, Swiss Francs, later British Pounds and US-Dollars. We call our tokens CHF36, EUR36, GBP36 and USD36. Tier 1 means, their personal information got (automatically) confirmed via a bank transfer. In Tier 2 status, legal documents confirm their identity and source of funds. As a Tier 2 verified user, you can use the following functions with absolute comfort without limits. 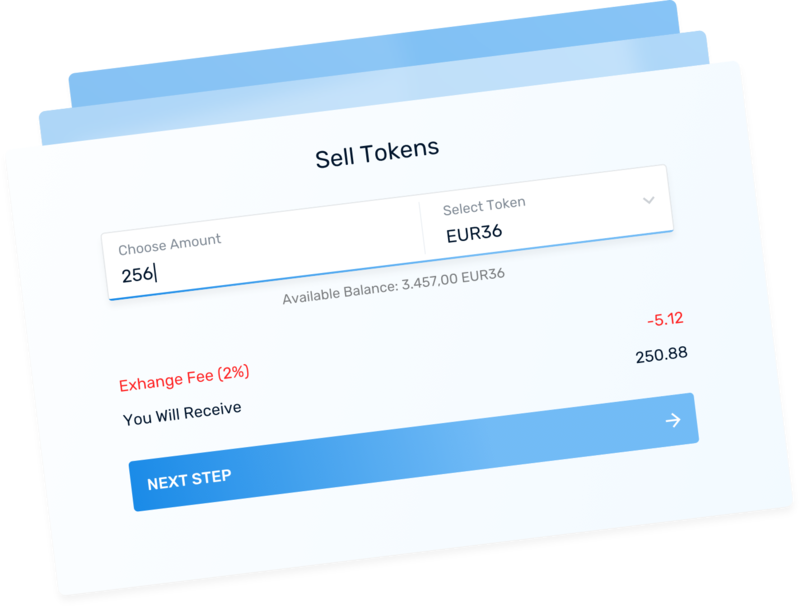 Buy and sell our Fiat tokens at our exchange where we keep the exchange rate at a constant one-to-one. Transfer real money like cryptocurrencies - which is faster and more reliable. By using our system you are automatically compliant to international anti-money-laundering rules, even if you need to transfer larger sums. 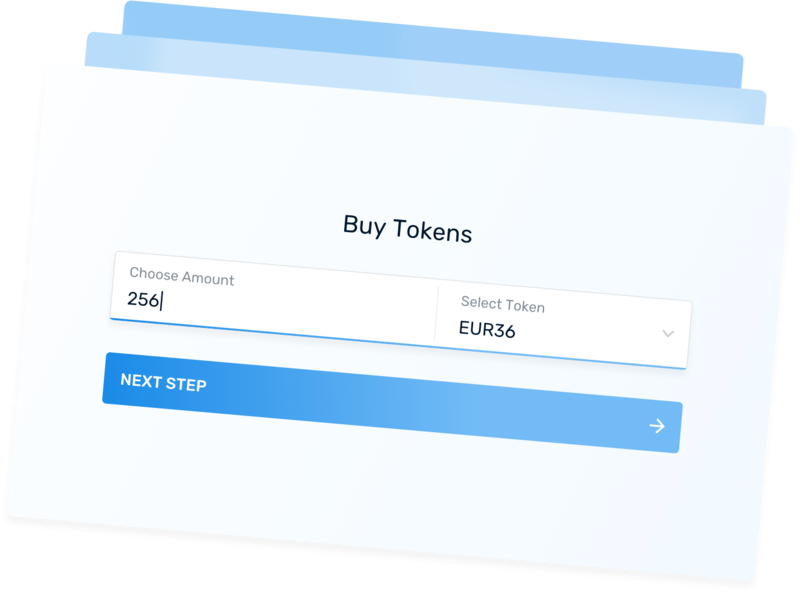 We offer automatic on- and off-conversion of fiat tokens. Just show them the QR-code or the bank details and your users will never notice that they interacted with a Ðapp. This way you can reach a much broader audience for your services than solely building on wallets. 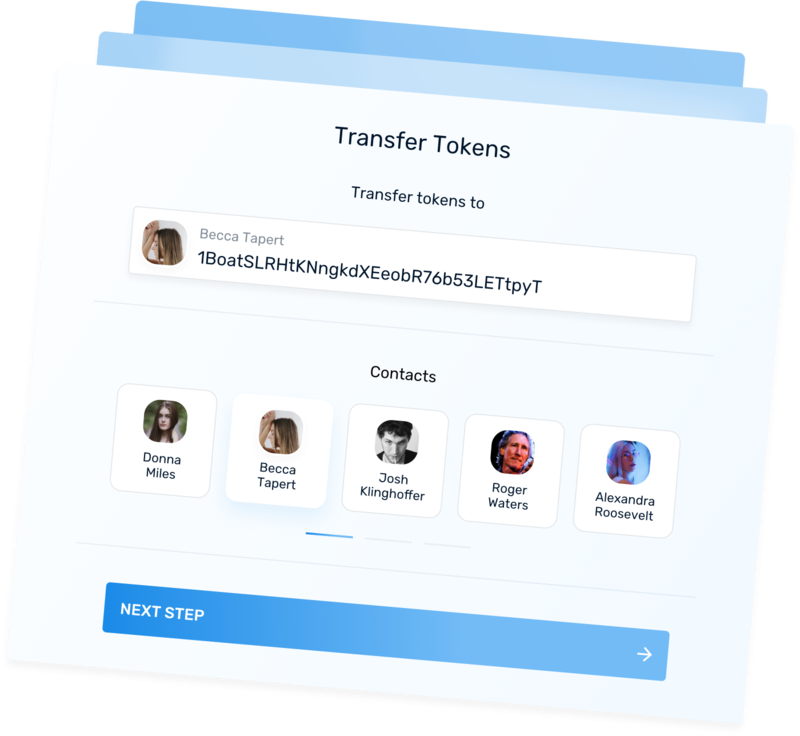 Integrate our user onboarding procedure - we do the conversion of our Fiat tokens and transfer them directly into your Smart Contract. We not only provide a stable-coin, but also “Compliance as a Token”. Outsource your AML to us by using our tokens and use our automatic banking bridge to address markets beyond crypto. With element36 it’s possible to use the power of blockchain for your digitization projects. Create digital platforms to manage your processes and funds. Exchange funds globally and instantly without a recurring hassle of AML processes.